Love them or hate them, Beats products have been the deﬁning trendsetters for the past few years in headphones. Now, Beats is looking to expand to the boardroom with the new Beats Executive. These headphones come with active noise-cancelling features, and are targeted at those always on-the-go. 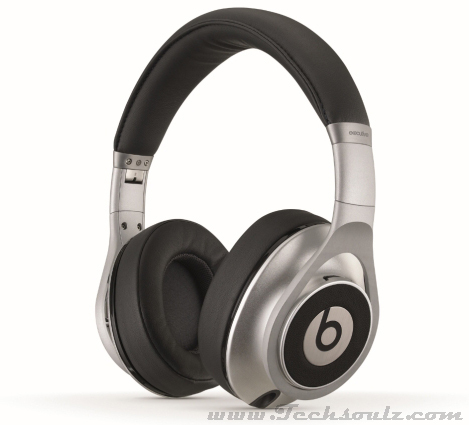 Gone is the old, chunky and ﬂashy plastic exterior typical of Beats gear; instead, the Executive sports a more sedate monochromatic color scheme, which should appeal to the target older demographic. The addition of brushed aluminum on the ear-cups further gives the headphones a classier demeanor. Of course, Beats being Beats, the headphones still come with their signature red detachable cables, which do stand out on the Executive. From its form and function, it seems like the Executive is going head-to-head with the Bose QuietComfort 15. Like the latter, Executive can be folded into a more compact form, and the package comes with a travel carrying case, making it suited for use on-the-go. A dual-plug adapter is also included so that you can use these cans on long ﬂights. Being active noise-cancelling by design, the Executive needs power, which is supplied by a pair of AA batteries. The earcups and folding mechanism are built relatively sturdily, and should be able to take the rigors of travel well. Seeing that the Executive costs a whopping $490, their performance is somewhat of a letdown. For its core functionality, namely reducing noise, the headphones are unable to compete with the Bose QC 15. We used the headphones on the MRT and at work. Noise from fans and running computers were adequately blocked out, but when travelling in the train or on a bus, surrounding noise was still obvious. Passive noise isolation performance was subpar as well; during our testing we were able to clearly hear our colleagues around us. Another major gripe with the Executive is that the headset only really works with power. Without charged batteries, or with the active noise-canceling features turned off, the Executive doesn’t work. For music, the tonal characteristics of the Executive don’t fall very far from the Beats tree, with heavy bass throughout that threatens to overpower the rest of the audio spectrum. Essentially, the Executive is a pretty pair of headphones that happen to be quite portable; if it’s a visual impression you want to make, then these will do the job. Otherwise, if noise-cancelling performance is important, you’re better served elsewhere.